Social Risk – the exposure to adverse consequences stemming from population-based activities and negative public sentiment – has dramatically increased in recent years. It impacts organizations across the globe and costs companies, on average, 5.7% of their annual revenue. Social Risk already outpaces traditional forms of risk, is responsible for the removal of more business and government leaders in the past three years than in the past thirty years combined, and is projected to increase ten-fold over the next five years. The factors that influence an organization’s success have radically transformed in recent years. Technical and social changes amplify the voices of citizens across the globe, causing record-high levels of Social Risk. Despite these developments, the methods used to forecast and manage risk have remained largely unchanged. Typical methods focus on quantitative models that evaluate country, industry, and political risk, and overlook the most important indicator of an organization’s success: public perception. 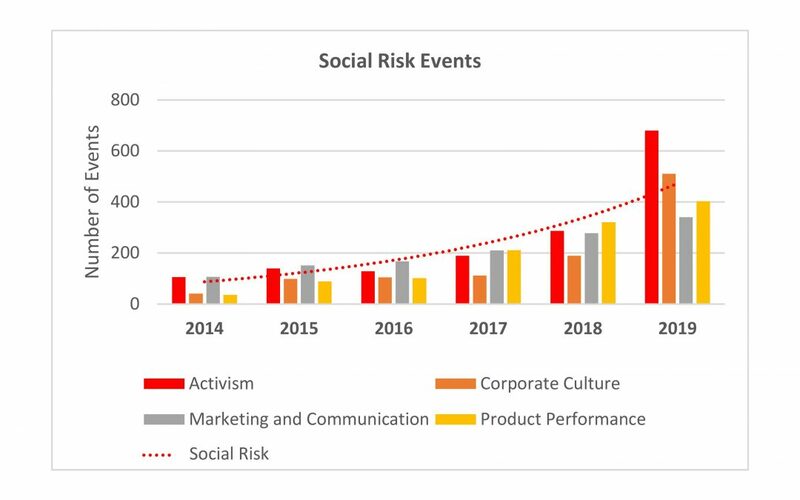 ENODO conducted an investigation to demonstrate how Social Risk impacts organizations. Analysts collected data from financial reports, open source news, and online publications, over the past five years, to quantify negative public perceptions associated with different Social Risk categories: (1) activism, (2) organizational culture, (3) marketing and communications, and (4) product performance. The study found that Social Risk events are often interrelated, however, they manifest and impact an organization’s performance quite differently. 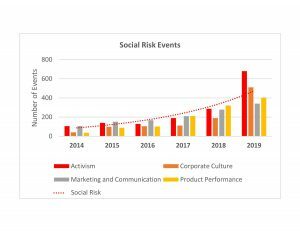 Additionally, overall Social Risk events have increased steadily since 2014 and are on pace to double in 2019 from the previous year (Figure 1). A brief description of each category, along with real-world examples, is found below. Activism is the most prominent and disruptive form of Social Risk. It manifests in online attacks, protests, activist investors, and social movements, which requires significant investments in management time and resources to address. A record 229 companies faced activist campaigns in 2018 by pension funds, insurance companies, endowments, banks, and hedge funds that leveraged their financial influence to pressure management for change. Dozens of others faced pressure from outside activists and movements from #BlackLivesMatter to PETA. Organizational culture defines the norms and codes of conduct within an organization. Corruption, greed, misconduct, and any type of –ism (e.g., sexism and racism) significantly hamper an organization’s success. Recent examples include Wells Fargo’s fraud scandal, sexual harassment allegations against Google, and the dozens of political and business leaders ousted from office due to charges of corruption. Marketing and communications campaigns from corporate executives, advertising teams, and political leaders present unique challenges when messaging does not align with public opinion. Cringe-worthy marketing and advertising flops like Pepsi’s, Dove’s, or Papa John’s illustrate the recent increase, and organizations’ inability to understand public sentiment. Product performance refers to the quality of goods and/or services an organization provides relative to consumers’ expectations. Vale S.A., PG&E, and Johnson & Johnson provide timely examples of organizations currently facing severe backlash due to the quality of their products or issues within their supply chains. Despite the obvious impacts of these Social Risk categories on organizations’ success, corporate leaders across industries have lacked the systematic tools needed to address each. ENODO’s Social Risk analysis addresses this deficit by delivering a consistent metric to compare firms across industry by leveraging a single variable – public perception – to measure, forecast, and reduce an organization’s Social Risk exposure along each category. Social Risk analysis also informs the design of Social Risk Screens, a first-of-a-kind offering, which builds upon the widely accepted principle that investor perceptions determine a company’s performance (i.e. stock price). ENODO’s screens serve as a leading indicator of company performance. They measure public sentiment across country, industry, company, and political risks, delivering an effective alternative to Environmental, Social, and Governance (ESG) investing. Today’s dynamic environments require new techniques, procedures, and strategies to identify, manage, and defend against Social Risk. Social Risk analysis provides a roadmap for organizations to address underlying risks, enabling leaders to protect their organizations’ personnel, operations, reputations, and bottom-lines, in a time when doing so has become increasingly complex.